Thrive Applesauce will be your new favorite quick snack. Just add water to the mixture and you will have a creamy applesauce that is made just the way you like it. 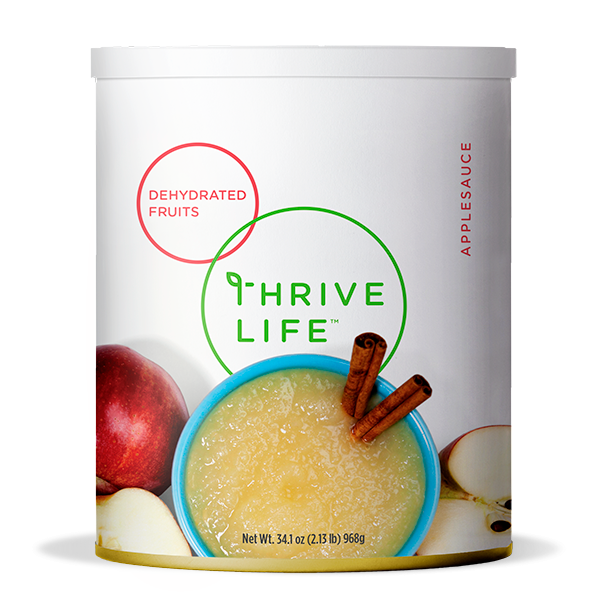 Thrive Applesauce will be ready anytime you want it for a snack or ingredient. Add 2 1⁄2 cups cold water and 1 cup Applesauce powder to a blender and blend on high until smooth. Let cool in refrigerator for at at least 1 hour. Apples are the only ingredients in our Applesauce, so it’s a great all-natural snack. For a sweeter twist, add 2 tbsp. sugar and 3⁄4 tsp. cinnamon. Use it in place of butter or oil in baked goods for low-fat recipes, or add it to smoothies as a thickener.